The other night, as I was driving around in dejection after having suffered another classic evening of cribbage defeat at the hands of my father’s suspect shuffling, I found myself heading south on Snelling Avenue with the ultimate destination of Amtrak’s Midway Station. I sometimes hang out there at night to watch the train come in – an activity I’ve ramped up in recent months, since, if all goes according to plan, Amtrak will soon be moving back to the Union Depot and Midway will be abandoned, and, we can only hope, subsequently demolished. I had acquired coffee, and was on my way to acquire a pastry when I came across University Avenue, and, of course, the brand new light rail tracks. A familiar train of a rant streamed back into my consciousness: As a general public transit advocate, i.e., someone who enjoys getting around by any method other than a car, and helping others figure out how they can to do the same, I like the idea of being able to walk out of my house, get on a train, and end up somewhere else. However, I am conflicted about how these lines are coming about. The party line has always been about “reducing congestion”. Ask anyone who drives on Hiawatha Ave. about reduced congestion! This new line is going to be much worse. Outside of downtown, in South Minneapolis, the Hiawatha Line (which, in a fit of Big City Envy was recently rechristened ‘The Blue Line’) has 10 grade crossings; in contrast, in between the downtowns, the new line has close to 40 of them. It’s a bit ironic that the two biggest transit systems in the country, those of New York and Chicago, abandoned their surface lines in 1936 and 1947 respectively, pushing all rail transit either above or below ground, but, we chose not to be informed by that. No, of course the real reason to build the line has much less to do with moving people around, and more to do with lining the pockets of developers, who, as we speak, are systematically replacing anything that has any character with clone after clone of the same boring six story building containing retail on the ground floor, and “luxury apartments” above, surely to become utter eyesores in ten years. “Progress”. Ultimately, though, it’ll be a good thing for the city. Nobody will be around to remember what it used to be like, and all will be swell. Having exhausted those rather cynical thoughts (but let’s face it, they’ll probably crop back up at some point), I crossed back over University at Cleveland, newly acquired pastry at the ready. A police car was sitting at the intersection with its lights on. “Something’s going down somewhere”, I shrugged as I made my way up the block to the Amtrak depot. The westbound Empire Builder pulled in as usual, and in a refreshing departure from the norm, it was almost exactly on time. Near the end of the nightly trade of humanity that occurs on the platform, I heard a train horn through the music I was playing. Very odd, I thought, since the train generally only blares its horn to indicate its immiment departure, which, at that time, was still several minutes away. I cracked the window, and then heard it again – and it certainly was not the horn of an Amtrak P42, but one of the fakey-sounding horns that adorn our local light rail cars! The night was foggy and still – perfect weather for effective sound transmission – but there’s really no way that the horn of a Hiawatha train could have travelled that far. I immediately started driving. They’re running a test of the new line, dummy! That’s the reason for the cops and the blinking stoplights! Once I had swung onto University, I could see that ALL of the intersections were blinking red. I didn’t know which direction it had gone, so I tried going west. By Raymond, the blinking had stopped, so I concluded that the train had actually headed east. Off I went back that way. 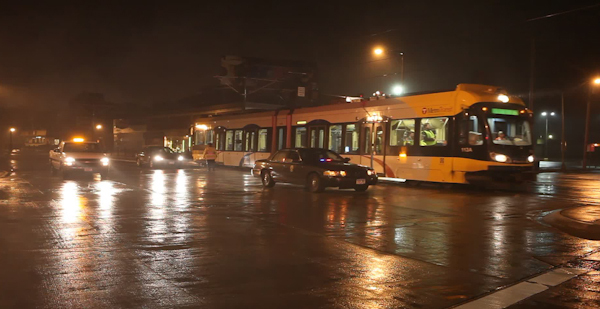 Cleveland, Prior, Fairview, Snelling, Hamline, Lexington, and finally, at Chatsworth, there it sat: Car 113. I recalled riding on that very car on the opening day of the Hiawatha line back in 2003. The night obviously wasn’t over, so I went around the block to get some gas before anything further happened. While I was waiting at the pump, the train came flying down the tracks, doing, I thought, at least 35mph. Of course, the chase was hampered by the blinking red lights at every corner, and the presense of the police that obligated me to stop at every one. By the time I caught up, the train was already at Prior. This was starting to be fun. I drove home to grab my camera bag – the point-and-shoot I had with me would not do – and came back. By then, they’d made it back to Chatsworth. Even though it was now well after midnight, people were starting to gather on the street corners, and traffic seemed to be picking up. It seemed like the word was out! Or more likely, the neighborhood was waking to their first taste of the noise pollution this train will wreak on them. The horn was being blown with impunity at every crossing – much louder than any car horn – and I wondered, in fact, if it could be loud enough to be in violation of city ordinances. South Minneapolis went through the same thing ten years ago. South of Lake Street, the line travels along the side of several residential neighborhoods, and even though those neighborhoods are somewhat isolated from the tracks by earthen berms, the people living in those neighborhoods complained bitterly about the horns. There are federal regulations that dictate how and when horns must blow, and it turned out that the only way to appease the neighbors AND the feds was to slow down the train. I can only imagine that the same exact thing will have to happen along University. Back at Chatsworth, they seemed to be readying another test, so I drove ahead to figure out a place to set up a shot. Oops, nowhere to park! The tracks had eaten up nearly all of the spaces! I ended up parking on Charles, in front of the Goodwill. I walked down to Fairview and University, and set up my tripod. Then I pulled out the day’s NYT crossword, and started waiting out in the drizzly night. The cops were still there, but hunkered down in their car. The camera got wet, the crossword got wet (but it was still solvable by space pen! ), and I got soaked, but just as the chills started to settle in, around 2am the cops spun up their lights and started directing traffic again. Showtime. I was hoping for some nice dramatic video of the train streaking by, but instead, it was crawling, and anyway, the shot was blocked by a gaggle of cop cars and electric trucks and supervisor trucks chasing along, and one poor civilian in the left turn lane who was forced to wait for several minutes before he could make his turn onto Fairview. Get used to it, pal!